The AirPTS 1040 suite of professional tax software solutions is built based on the needs of your high-volume tax business and enables the efficiency and reliability that are essential to your success. Whether you are a large organization with multiple locations supporting a diverse customer base, or a highly successful single-office operation, AirPTS 1040 is your tax software solution. With both desktop and online solutions available for multi-site tax preparation businesses, AirPTS 1040 Professional Tax Software works with your organizational model. Your needs as a multi-site tax business supporting a diverse customer base are different. The AirPTS 1040 Team understands that your success is dependent upon the ability to provide your taxpayer clients with fast and accurate tax refunds and bank products. And while your professional tax preparation software plays a vital role, you also need a partner that appreciates your business and is dedicated to ensuring your success year-after-year. With both desktop and online tax software solutions available for multi-site tax preparation businesses, AirPTS 1040 works with your organizational model. AirFP offers strategic tools and unmatched resources to help professional tax preparation Resellers and Service Bureaus increase revenue by providing their taxpayer customers with the innovative, industry-leading professional tax software and features required for success. With business development, software training, sales, marketing, and technical support included, the AirPTS 1040 Channel Program provides the tools and resources needed to continue to grow your professional tax preparation business. Our program advantages are driven by our partners' needs, and offer added value that will benefit your professional tax preparation business. AirFP is committed to your growth and success as our Channel Partner. 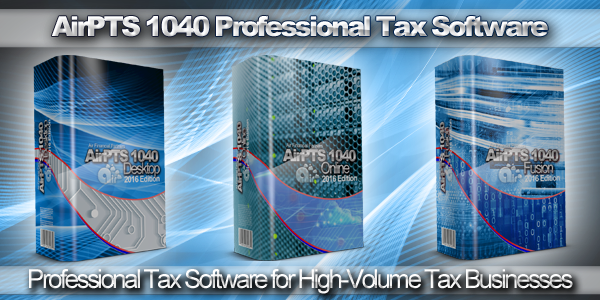 AirPTS 1040 software is built based on the needs of your high-volume tax preparation business and enables the efficiency and reliability that are essential to your success. When you select AirFP and AirPTS 1040, you select a partner dedicated to the success of your high-volume tax business. Your needs as a high-volume tax preparation business are different. The AirPTS 1040 Team understands that your success is dependent upon your ability to provide your taxpayer clients with fast and accurate tax refunds and bank products. And while your professional tax software plays a vital role, you also need a partner that appreciates your business and is dedicated to your success year-after-year. At Air Financail Partners, we work directly with our customers to find out what they need in order to have a successful and profitable tax season. These face-to-face meetings have led to the introduction of hundreds of customer-inspired technology innovations that make our industry leading professional tax software even more powerful and profitable for AirPTS 1040 customers. A single management interface for tax preparation office reporting that puts user and group summaries, financial totals, IRS acknowledgements, daily activity, bank product information, and more at your fingertips so that you can manage your tax preparation business the way you want. Start a tax return and capture all of the data on the W2 and K1 by simply scanning the 2D barcode with a AirPTS 1040 certified handheld scanner. All of the captured information is automatically added to the tax return and the Client Data page – speeding the processing of returns and shortening the client interview process. A simple, integrated way to send text messages to your clients' cell phones - directly through the AirPTS 1040 professional tax preparation software interface. With TextLink, exclusively from CrossLink, you can communicate with one or many taxpayer clients with a single click. AirFP customers have the ability to improve efficiency and control their tax office operations all in the palm of their hand with AirPTS 1040 mobile applications. Using CrossLink mobile apps, CrossLink customers are able to perform reporting, receive product and tax industry updates, and manage office functions straight from their iOS (iPhone) and Android mobile devices.